March has been an excellent month for me when it comes to paying back my student loans and it has exceeded expectations by far. There are two reasons for this, one being that I received my bonus for 2013 this month and the second reason I can’t reveal to you yet! The second part is really good news, but I don’t have all the details yet and nothing is official. I will be doing a follow-up post based on the news in the coming weeks, but I wanted to share what my student loans look like at this moment. 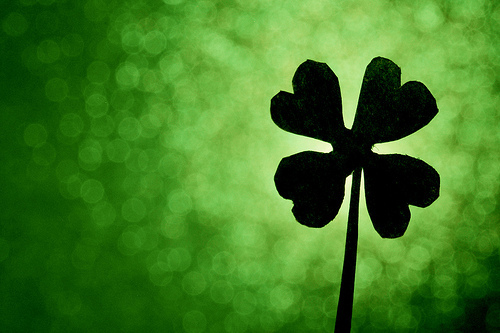 With my bonus I was able to put over $3,000 towards my loan principal this month so I was very excited to write and share this post with everyone! As you can see, the bonus made a huge difference this month and I was able to increase the amount paid towards my loans by over $1,000. I received a bonus of $1,500 and decided to put $1,200 extra towards my student loans this month while letting the other $300 go towards my emergency fund and other expenses. You may also notice that I switched my strategy up a bit, temporarily moving away from my private student loans. That has to do with my soon to come news, as well as switching up my loan payment strategy a bit. I made the $500 total minimum payment on both of my private loans and then put the other $1800 towards my government loans to hit the $2300 I’ve been trying to hit each month. I then took the extra $1200 from my bonus and also applied that to my government loans too! This extra payment helped me completely pay off one my highest interest government loans at 6.8%, so I will never have to deal with Government Loan #4 ever again – awesome! I then took the extra and put that towards another 6.8% interest rate loan, Government Loan #6 and knocked that down by over $800. 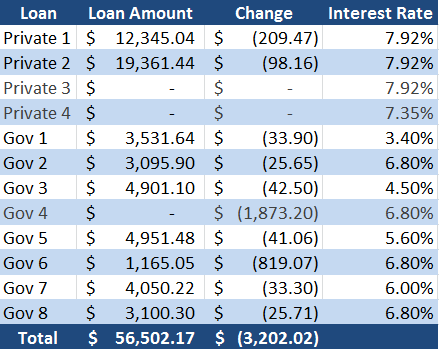 I should be able to completely pay that loan off next month if things go according to plan, and then I’ll move on to either Government Loan #2 or #8 which are the next 6.8% interest loans in line. The bonus this month was huge and slowly but surely my debt is finally starting to reach more manageable numbers. I’m a long ways off from where I want to be, but more months like this and I will be very happy! My progress has skyrocketed this month with these payments! I’m well on my way towards hitting the $20,000 goal with 9 months still remaining, and now I am actually slightly above pace to hit my stretch goal as well. It will probably be back to my normal payments next month, so hopefully that pace will keep me hitting both goals. Awesome job! I did the same thing with my bonus and cut down a year and 5 months of loan payments and recalculated my projections to pay off all my student loans in two years! It feels great to see the light at the end of the tunnel! Great job! It must feel awesome to knock out another loan. I can’t wait to hear the upcoming news! Thanks! It’s an awesome feeling since I haven’t been able to do that in a while, been just plugging away at my huge private loans. I’m still looking to work out a few other details before I can confirm it, but hopefully I will have a post either this week or next week with the good news.